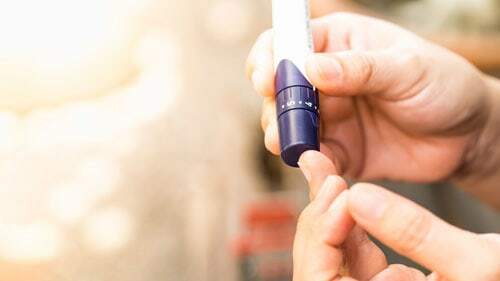 Type II diabetes is a chronic medical condition where glucose (sugar) levels accumulate in the bloodstream, commonly caused by insufficient amounts of insulin. However, the diabetic condition can occur when cells develop and insensitivity to insulin causing glucose levels to accumulate. Metabolizing glucose using insulin is a crucial component to life because it provides a fuel source for generating energy in the body. Insulin is a necessary hormone that regulates sugar metabolism. While there is no cure for type II diabetes, it is not always a lifelong condition. Many individuals can manage their diabetes by eating a healthy diet and maintaining a healthy weight through exercise. However, if exercise and diet are not sufficient to manage blood glucose levels, the doctor may prescribe insulin therapy or diabetic medications. Type II diabetes is different than Type I diabetes where the body no longer makes insulin. The condition was once referred to as noninsulin-dependent or adult-onset diabetes. Who Is at Risk for Type II Diabetes? Weight – Obesity and being overweight are the leading risk factors for developing type II diabetes. Statistics show that individuals with more fatty tissue tend to develop insulin resistance in their cells. However, being overweight is not the only factor for developing the condition. Fat Distribution – People who tend to store their fat in their abdomen are at a greater risk of developing type II diabetes compared to bodies that store fat and other areas including the hips and thigh. Inactivity – Remaining active in a physical lifestyle can significantly reduce the potential risk of developing type II diabetes. Physical activities help maintain weight, burn excess sugar levels as energy and ensure that the cells will remain sensitive to insulin. Age – The older we get, the greater chance we have of developing type II diabetes, especially after reaching 45 years of age. However, this risk factor might be associated with growing older, exercising less and losing more muscle mass as a part of the aging process. However, the numbers of younger adults, adolescents, and children developing type II diabetes have risen significantly in the last few decades. Genetic Predisposition – Having a family history of type II diabetes increases your potential risk of developing the condition too. Ethnicity – Although scientists have yet to determine why, individuals of specific races, especially blacks, Native Americans, Asian-Americans, and Hispanics are more at risk of developing type II diabetes compared to Caucasians. Prediabetic Condition – A prediabetic condition can develop where blood glucose levels are higher than acceptable norms but have not reached an elevated level to be classified as type II diabetes. However, without treatment, a prediabetic condition can lead to type II diabetes. Polycystic Ovarian Syndrome – Irregular menstrual periods, obesity, and excess hair growth associated with polycystic ovarian syndrome increases a woman's potential of developing type II diabetes. Gestational Diabetes – Women who develop gestational diabetes when pregnant have an increased potential risk of developing type II diabetes. That said, women who birth babies weighing 9 pounds or more are also at risk of developing the condition. Neuropathy (Nerve Damage) – Excessively high glucose levels can injure capillary walls that provide oxygen and nutrition to the nervous system, especially in the lower extremities. This is usually detectable by a numbness, tingling, painful, or burning sensation that starts at the tips of the fingers or toes and radiates upward. Men can also experience erectile dysfunction caused by neuropathy. Heart and Blood Vessel Disease – The diabetic addition can significantly increase the potential risk of developing various cardiovascular issues including chest pain associated with coronary artery disease, stroke, heart attack, atherosclerosis (narrowing of the arteries), and high blood pressure. Nephropathy (Kidney Damage) – The diabetic condition can damage clusters of tiny blood vessels in the kidney that filter waste out of the bloodstream. In severe cases, the damage is irreversible and leads to end-stage kidney disease that usually requires a kidney transplant or regular dialysis treatments. Foot Damage – Poor blood flow or nerve damage in the feet can lead to significant foot complications. Without treatment, a blister or cut can lead to a serious infection that never heals. In the most severe cases, amputation of the toe, foot or leg is required. Eye Damage – The diabetic condition can cause significant damage to the retina's blood vessels (diabetic retinopathy) that might lead to blindness. Many diabetics also suffer from glaucoma and cataracts. Hearing Impairment – Diabetics tend to have more serious hearing problems compared to individuals without the condition. Skin Condition – One of the side effects of type II diabetes is a susceptibility to fungal and bacterial infections on the skin. Alzheimer's Disease –. Although scientists have yet to determine why, the condition increases the potential risk of developing Alzheimer's disease. Glycated Hemoglobin (A1C) Tests – This test provides average blood glucose levels over the course of three months by measuring the percentage of blood glucose that attaches to hemoglobin. Random Blood Sugar Test – Determining blood sugar values at random times can help determine if diabetes is present, especially in individuals who experience extreme thirst or frequent urination. Oral Glucose Tolerance Test – After fasting overnight, the patient's glucose levels are measured before drinking a sugary liquid and having the blood glucose levels checked again 2 hours later. Routine screening for a diabetic condition is important for individuals who are overweight or 45 years and older. Treating type II diabetes requires an effort by the doctor and the patient. The doctor will recommend eating a healthy diet of fruits, vegetables, and whole grains and participating in physical activity of at least 30 minutes that involves aerobic exercise 5 to 6 days every week. Patients are reminded the physical activity can lower blood glucose levels. The doctor will also carefully monitor blood glucose levels that are often unpredictable. Insulin therapy and diabetic medication may be necessary. If so, the doctor may prescribe Metformin, sulfonylureas, meglitinides, thiazolidinediones, DPP-4 inhibitors, GLP-1 receptor antagonists, STLT2 inhibitors, or insulin therapy through injection. In severe cases, bariatric surgery might be the only option if the individual has a BMI (body mass index) higher than thirty-five.